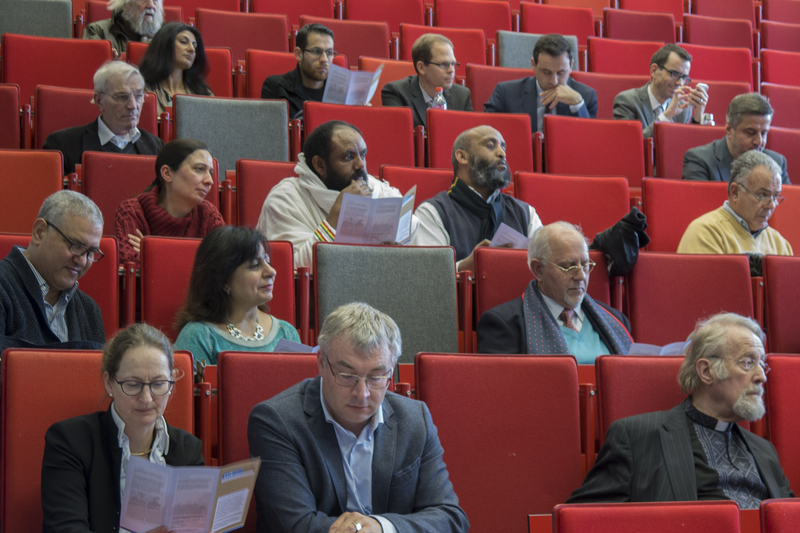 The Pre-Master/Minor Programme is designed to provide a basis in Orthodox theology. It is also intended to raise the student’s academic level to be able to enter the Orthodox variant of the Master Spiritual Care. The entry requirements are a Bachelor’s degree, which may be in a subject other than theology, from a regular university or a Dutch university of applied sciences (HBO) and general familiarity with the Bible. In the Pre-Master/Minor we will study the rudiments of Orthodox history, the reading of Scripture, theology, liturgy, and spirituality. During the course of the Pre-Master/Minor, students will compile a portfolio of the work they have undertaken during the programme as well as knowledge and skills that they have acquired elsewhere. The teaching faculty are: Fr John Behr, Fr Michael Bakker and Fr Joan Lena. The Pre-Master/Minor programme is set at 30 European Credits (1 EC = 28 hours of study), and consists of five modules (each of 6 EC) during the two semesters of the academic year. The programme is taught in a ‘blended’ or ‘hybrid’ format, that is, it utilizes both online and residential components: the first six weeks of each period will be done online, followed by a weekend face-to-face residential session, and concludes with a final week in which students prepare their work for submission. This format involves what is known as the ‘inverted’ or ‘flipped’ classroom, where, instead of hearing from the professor during the class session and then working independently outside the class, students now learn collaboratively online and bring the fruits of their work to the intensive residential session, where they are now ready to present and discuss their work. The online components of the programme can, within the framework of the deadlines assigned, be completed at the student’s convenience; the residential component is a necessary (and mandatory) component of the course. At the start of the programme there is a general orientation day to acquaint yourself with your fellow students, the Pre-Master/Minor programme and the learning management software Canvas. Technical staff of VU are working hard to provide access for students who have enrolled and possess a ‘VUnetID’ to Canvas, in which we will provide an orientation module to the Pre-Master. 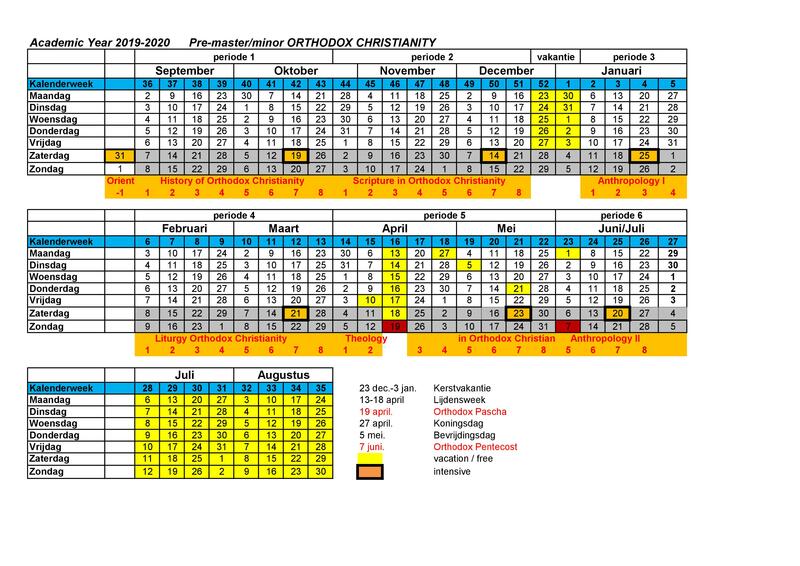 Below you’ll find the schedule for the academic year 2019-2020. The classes are taught in English. VU Amsterdam requires you to take an English test and to submit your score as part of your application. You’ll find more information here. The cost of the Pre-Master is € 1030 for the academic year 2019-2020. If you are interested in this programme, please contact us through this form. You will be contacted and receive information about the admission procedure. You can also use this form if you are a bachelor student and would like to do the Pre-Master as a 30 EC Minor programme in 2018-2019 or a following academic year. It will you provide you with a solid academic introduction to Orthodox Christianity. You are welcome to study alongside the Pre-Master students. Both Pre-Master and Minor students may enrol after this programme in the Master programme.